Pressure The Pok�mon raises the foe's PP usage. Opposing Pokemon must use 2 PP per move. Ruby/Sapphire DEOXYS emerged from a virus that came from space. It is highly intelligent and wields psychokinetic powers. This POK�MON shoots lasers from the crystalline organ on its chest. Emerald A POK�MON that mutated from an extraterrestrial virus exposed to a laser beam. Its body is configured for superior agility and speed. 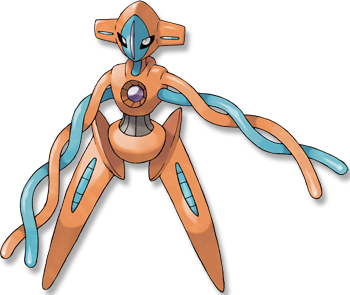 FireRed This DEOXYS has transformed into its aggressive guise. It can fool enemies by altering its appearance. Leaf Green When it changes form, an aurora appears. It absorbs attacks by altering its cellular structure. Diamond/Pearl An alien virus that fell to earth on a meteor underwent a DNA mutation to become this Pok�mon. Platinum An alien virus that fell to earth on a meteor underwent a DNA mutation to become this Pok�mon. Heart Gold DNA from a space virus mutated and became a Pok�mon. It appears where auroras are seen. Soul Silver DNA from a space virus mutated and became a Pok�mon. It appears where auroras are seen. Black An alien virus that fell to earth on a meteor underwent a DNA mutation to become this Pok�mon. White An alien virus that fell to earth on a meteor underwent a DNA mutation to become this Pok�mon.